This book for early readers is a story about a boy, a girl, a grandpa, thousands of cicadas, and lots of other hungry critters. The grandpa (an entomologist) helps the children satisfy their curiosity about their own nature as well as the nature of these amazing cicada bugs, who can live underground for seventeen years before they come out buzzing. 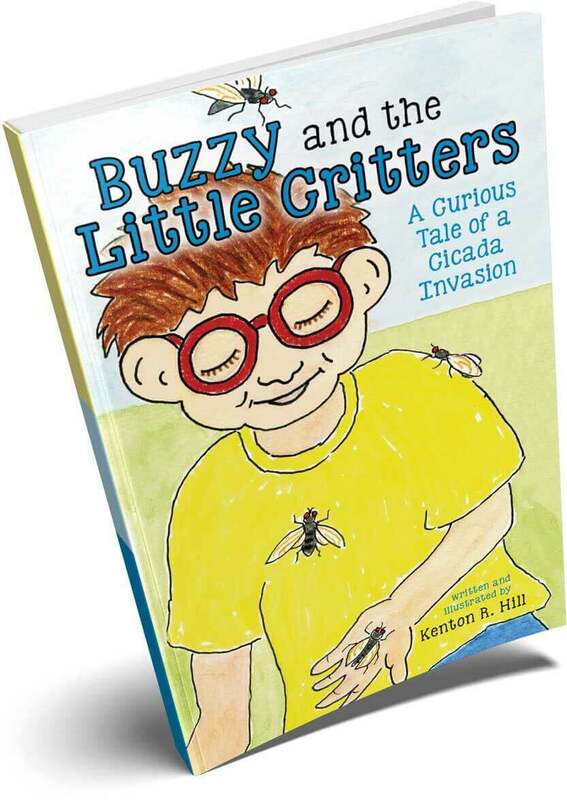 Following Buzzy’s story, which includes an exciting action-packed dream scene, Ken shares more interesting facts and scientific information about this amazing bug. There is also a chart forecasting when and where the 17-year cicadas will arrive next. After a career as a teacher, counselor, school principal, and leadership coach, Ken is now writing and illustrating children’s books. He and his wife live in Portland, Oregon, where sadly there are no cicadas. Buzzy and the Little Critters is a cool little book! I love it! This illustrated story is a fun and interesting way to share the exciting world of insects with young readers and launch them into further investigation. I am impressed with the thorough, accurate facts and reference material to back up the story. A good story and good science. Buzzy and the Little Critters is a well-written story that reads well. After reading it to over one hundred of our kindergarten students, their collective response was, “It’s good. We like it.” My second graders agreed. They particularly liked the dream scene and superhero, the interesting facts and wonderful illustrations. I believe the story is a great format for a classroom teacher to use, especially if students are learning about the life cycle of an insect. I liked that the book had a boy in it with my name and that it was about insects and animals. I liked when Buzzy head-butted the blue jay to protect the cicada. I learned that I will be 16 when the cicadas come out in the year 2025 in Massachusetts. I read it to my little brother, Gus. He liked it too. He asked me to read it to him again. Buzzy and the Little Critters looks great!!! I shared it with my Children’s Book Illustration class, and they were all charmed! My first graders were familiar with the life-cycle of the butterfly, but Buzzy and the Little Critters gave them information on another kind of insect, so that we could take the idea of metamorphosis a bit further. My students loved the hybrid of fiction and non-fiction. Since we don’t have cicadas around here, they especially liked the cicada facts at the end of the book. This book supported our first grade unit on animal parts and adaptations through the Next Generation Science Standards. I recommend this book to anyone looking for a fun and informative read of this strange and curious creature.